That momentum thing? West South Street seems to have it. 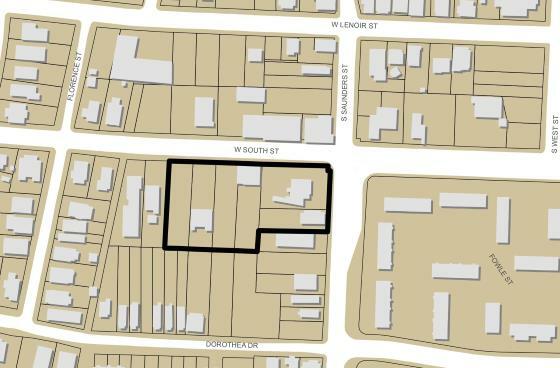 We’ve taken a look at the area before and now new site plans at the city show 42 residential units for a fairly large, combined parcel at the corner of Saunders and South Street. 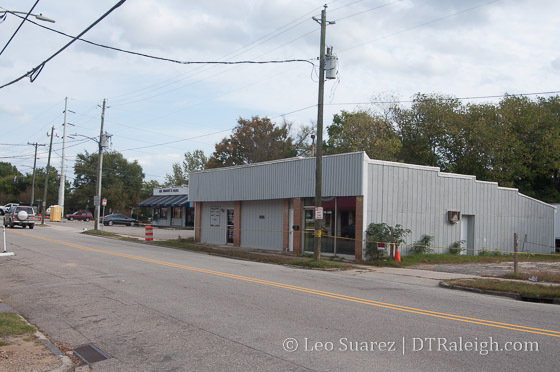 Lambert Development South Street LLC will clear out most of the properties from Saunders to Florence Street and bring two new residential buildings. At 3-stories in height and a combination of surface and covered parking (covered by the units) it looks like townhomes and/or apartments are planned. 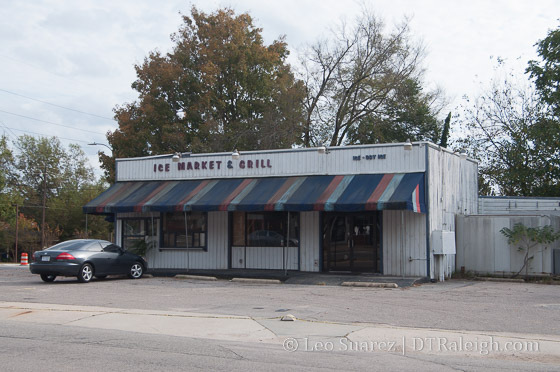 Simply called 611 West South for now, the plan will take out the Ice Market and Grill building, some empty lots, older homes, and auto-oriented business buildings on that side of South Street. 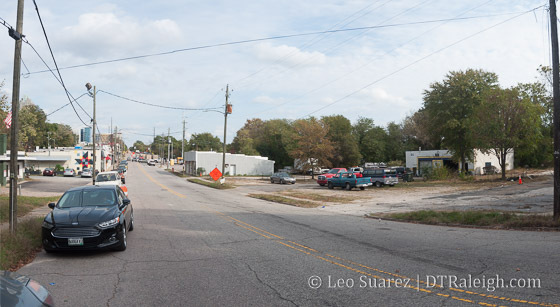 This area of South is a hugely neighborhood retail area so the lower-scale apartment/townhome combination (or whatever it ends up being) seems like a good transition out of the Boylan Heights neighborhood heading towards downtown Raleigh. I enjoy seeing units brought up to the sidewalk as well. With 42 units and 78 parking spaces provided, it isn’t the most urban of setups. However, some residents might prefer a quick trip down Saunders and to I-40 for commuting by car. 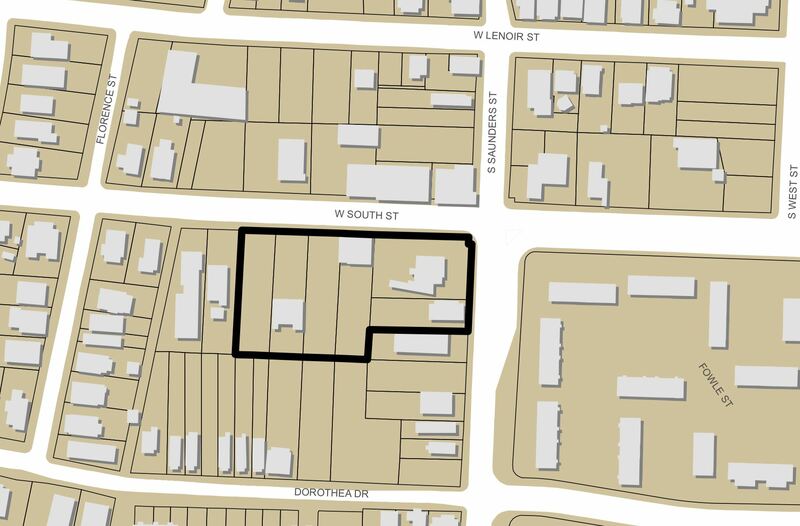 As the two-way conversion of South Street continues, more residents may find that the 600 block of West South becomes closer to destinations that it was in the past. Aww, nuts. Where am I gonna get my dry ice now? Appears to be a couple dozen locations in the Triangle. Thank you Leo! This plan looks great. Love the parking under the houses. Love the houses close to the street. Love the fact that no historic buildings will be lost. Agree that townhouses are a good transition between downtown to Boylan Heights. 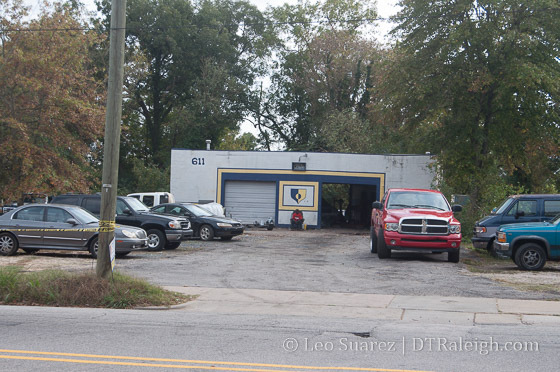 I’m curious what’s going to happen to the (apparently) largest of those units that don’t have the possibility of having a garage. Are they just going to be much, much larger due to their floor plates and lack of garage or are they going to be split into flats and utilize the surface parking in the lots behind the units? 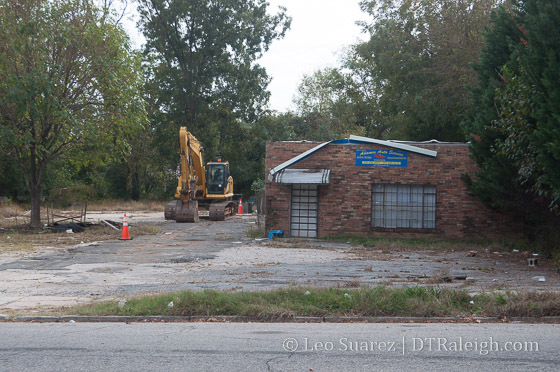 Next Up hopefully a major renovation of the public housing complex near this project. I’m sure its not politically incorrect, but the housing project is a perfect site for a stadium/arena. If the political trade winds prevent that option, then a mixed-use, market-rate-affordable/workforce housing blend is a perfect ‘redo’ of this site and a tremendous catalyst of SW section of the City.